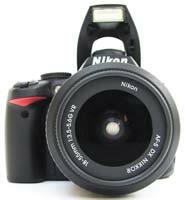 The Nikon D3000 is a new entry-level digital SLR camera designed to make photography simple and accessible. Aimed at the complete beginner, the D3000 is primarily aimed at anyone who wants to take photos without having to worry about what the camera is doing. The intelligent Guide Mode asks you about the image you want to capture and automatically optimizes the settings for the best possible results. 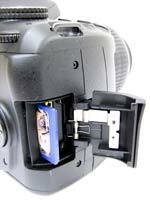 When you've gained more experience, you can then use the Guide Mode to find out how to adjust the settings yourself. 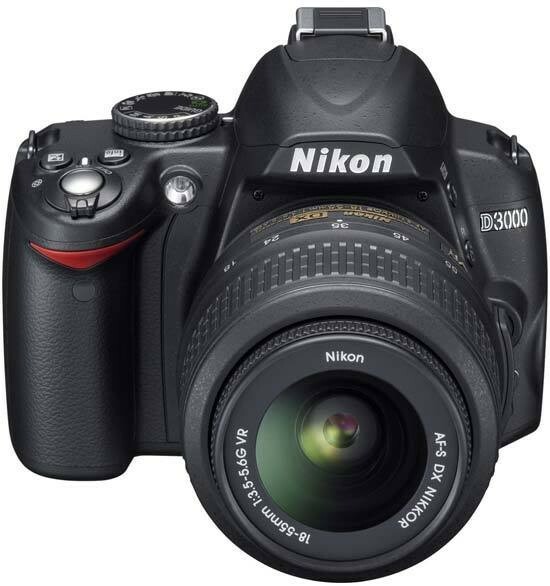 The Nikon D3000 also features a 10.2 megapixel sensor, EXPEED processing system, 3-inch LCD screen, 3 fps continuous shooting and 11-point autofocus system. 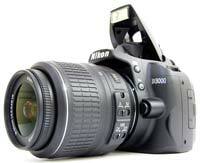 The D3000 is available now for £429.99 / €522.00 body-only or £499.99 / €607.00 / $599.95 with the 18-55mm VR kit lens. Rather than packing entry-level digital SLRs full of extraneous features that most of their target audience will never use, it seems manufacturers are now majoring on winning over owners of camera phones and compacts and introducing them to the more professional results achievable via DSLRs - with, they state, the minimum of fuss. A case in point is the new beginner targeted D3000 from Nikon, which upgrades the existing D60 model and is little brother to the pricier D5000, which most notably has the added features of video and vari-angle rear screen. For a body-only suggested UK retail price of £429 (or £499 with 18-55mm VR zoom supplied for our review), for the first time its maker has included what it's calling an Intelligent Guide mode, selectable via the otherwise familiar chunky top plate mode dial. This feature 'talks' - via explanatory text on the rear LCD - nervous novices through which settings need to be selected to achieve various desired results. Within this feature there's a menu choice of either 'easy' or 'advanced' operation - the latter getting more creative with advice on how to blur backgrounds and freeze motion. The theory is that greenhorns are provided with an on board tutor and that, as they 'play' more with the camera, their knowledge level will rise and hopefully their picture taking improve. It's a neat idea that might just actually work - provided, that is, said novice doesn't just casually stick the D3000 on auto and point and shoot. Aside from the on-board hand holding that helps set it apart (though Sony's A380 recently attempted something similar), the Nikon D3000's other main features include a 10.2 megapixel DX format CCD sensor, fixed 3-inch, 230k dot resolution back plate monitor, 3D subject tracking and 11 auto focus points spread across the frame - the latter being impressive specification for an entry level DSLR, especially as the D60 made do with a mere three AF points. 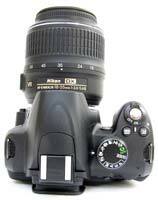 Also slightly better than average for its class is a maximum continuous sequential shooting speed of three frames per second; thus equipped the D3000 therefore comes across like a snapshot model on steroids. What this camera misses out on however is Live View plus a top mounted second LCD window to quickly review/alter settings; both to be found on admittedly pricier models higher up the Nikon range. As mentioned at the outset, there's also no HD video nor HDMI connectivity, but as this is the new budget model, such omissions are hardly surprising. That said it seems inevitable these features will trickle down to even entry-level models such as the D3000 before too long - a case in point being that you do get on-board dust reduction in the form of automatic sensor cleaning, activated on powering down the camera as a default. Held in the palm, the D3000's plastic resin construction body is only fractionally larger than Panasonic's DSLR-styled GH1, which of course also prides itself on being a marvel of miniaturization. With the 18-55mm zoom attached it's still sufficiently lightweight to, if required, fire off a shot single-handed, though gripping it in both hands of course feels more natural and acts an additional (to the VR lens) steadying influence, since like the rest of the range no built-in anti shake features. One thing to note when you pick the Nikon D3000 up and start using it is that, though the grip is sufficiently sized for the three lower fingers to mould comfortably around it leaving the forefinger hovering over the shutter release button, the eye relief for the optical viewfinder doesn't jut out very far, which means the user's nose is pressed up against the LCD screen when using it. 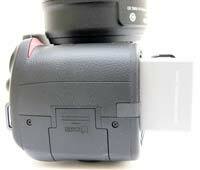 Said viewfinder is however sufficiently large and bright to get a good idea of detail when utilising manual focusing. And, with the on/off switch surrounding the main shutter release button, with a thumb flick users can be up and shooting from cold in just over a second. The Nikon D3000 is equally swift to find its target courtesy of 3D subject tracking and 11 auto focus points spread across the frame, with whichever is/ are in use indicated when the shutter button is depressed to the half way point. Go on to take the shot and there's no discernable shutter lag - a full resolution JPEG committed to memory in two seconds, a RAW file in three and combination of the two taking just a mere fraction longer. So far so good then. While front on the Nikon D3000 is visually unthreatening, the on-screen user interface you're presented with is surprisingly busy, and the more you delve into using the D3000 the more you realize it is no purely 'auto everything' camera. Incidentally, turn the camera on its side and said information display will also flip through 90° so it can be seen the 'right' way up. For those who do want to get hands on, an additional degree of creative control is provided by a Picture Control menu to be found within the camera's logically laid out and easily navigated on-screen folders - letting the user select the well saturated colours of 'Vivid' mode for example in preference to the more naturalistic Standard or Neutral - plus monochrome and pre-tweaked settings for portraiture and landscapes. In-camera retouching is additionally offered as an alternative to editing images once downloaded to your desktop, with a new miniature mode ape-ing the effects of tilt and shift lenses in rendering people when viewed from on-high as like toy figures in a model village. Adjusted images are saved alongside the original file, with the ability to adjust colour in camera and warm up formerly 'cold' images proving particularly effective. 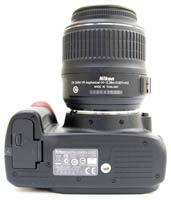 Unprocessed RAW file format shooting is present as an alternative to, or can be captured in tandem with, regular JPEG. However if you choose to shoot both together, only 'basic' quality JPEGs can be captured rather than the maximum 'Fine'. As expected at this level, pictures are committed to SD media card or higher capacity SDHC, and the built-in sensor cleaning prevents any undesirables intruding when swapping lenses and otherwise showing up as dust spots on images. 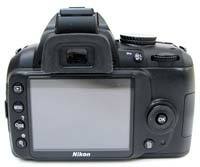 The competent Nikon D3000 includes the D-lighting feature consistent throughout the Nikon DSLR range, which automatically adjusts to even out tricky exposures - for example bright backgrounds and dark foregrounds that would otherwise result in a silhouette. Otherwise it's very easy to just activate the pop up flash to fill-in any shadow detail, with a hotshoe provided for attaching an optional flashgun. Taking a tour of the Nikon D3000 in more detail, the front is obviously nominated by the Nikon F lens mount, above which sits the built-in flash. Set into the slope of this are two operational buttons - the first logically for calling up the available flash options on the rear LCD, selected in tandem with a twist of the rear command dial that naturally falls under the thumb. The second button calls up the camera's self-timer. Beneath this sits a prominent, springy lens release button, and, moving over to the other side of the camera we find a combined AF assist illuminator, self-timer and red eye reduction lamp nestling between the grip and the sloping ridge of the flash. Underneath the familiar red Nikon 'slash' on the grip itself is located an infrared receiver for use with an optional remote. The top plate of the D3000 is similarly clean and unfussy, dominated by the aforementioned mode wheel, which clicks into place at each setting with just the right about of 'give'. Arranged around this are some 13 settings, comprising the grouped creative quartet of program, shutter priority, aperture priority, plus manual, the Intelligent Guide, and full Auto modes. We also get a dedicated flash off mode, so it won't automatically pop up and fire even if the lighting is poor (the flash can also of course be deactivated by pressing the dedicated flash button and twisting the command dial to the 'off' setting). Finally, six pre-optimised scene modes are thrown into the mix: portrait, landscape, child, sports, close up (macro) and night portrait, so if you want to purely point and shoot you can. Just forward of the mode dial, sitting behind the shutter release button - itself surrounded by an on/off switch - are a pair of large and identically sized buttons - the left marked 'info', with a single press logically bringing up the information display on the rear LCD that appears anyway upon power up, and the right for adjusting exposure compensation; here a broader than average +/- 5EV. Again, any adjustments are effected with an in tandem turn of the command dial, to be located top right of the camera back. Incidentally, while the eyelets for attaching the provided camera strap are located on opposite edges of the top plate, rather than on the sides, unlike say on the Olympus E-420, these are never close enough to where you put your fingers to get in the way - even with the strap itself attached. The final thing to note on the camera's top plate is the obviously accessory shoe for optional flash, safely covered when not in use. Moving to the back plate then, the Nikon D3000's 3-inch LCD dominates proceedings, above which is the previously highlighted upon eyepiece for the optical viewfinder, with dioptric adjustment slider for the myopic nestling unobtrusively into the right hand side. Again, the backplate mirrors the rest of the camera's design ethos in being visually clean and uncluttered - with less controls than might usually be found on some bridge models in fact. What's there is mostly clear, with an auto exposure/auto focus lock button to the left of the command dial we've touched upon previously. Directly below this, dead right of centre of the LCD, is a four-way multi-selector dial, just smaller than the thumb, for tabbing through menu options and images when in review mode. At its centre is the logically located 'OK' button for effecting any changes that need to be made and below both is a dedicated delete button, denoted with familiar trashcan icon. So far, so expected, and this continues over at the left hand side of the LCD screen with a run of four vertically arranged buttons that will be immediately familiar to users of Nikon DSLRs. From the top we have a playback button, a menu button beneath this and two further buttons again for zooming into or out from an image, as well as calling up captured shots as a series of thumbnails or requesting capture information be displayed on screen. There's also a question mark icon adjacent to the zoom button, which means that if you press it when not in image review but rather capture mode, the user gets a brief on-screen text explanation of the mode selected itself. The zoom out button also doubles as an information /edit button. Press this and you'll get an overview of the settings in use at the time. Let go of it and with the multi-selector dial, settings can be changed without having to delve into the menu/s proper. Neatly, as you tab through the on-screen options in this mode, thumbnail images of the type of picture you might be looking to achieve with said changes pop up in the centre of the screen. Hence, in choosing continuous capture you're logically presented with a picture of a rollercoaster. While that's it for the cleanly laid out camera back, to the right hand side of the Nikon D3000 we find a slide and flip open spring-loaded door covering an available slot for either SD or higher capacity SDHC card, while over at the other side of the camera, as expected we encounter ports for AV and USB out, covered by a rubber flap. The base of the Nikon D3000 features a just slightly off-centre screw thread for attaching the unit to a tripod, alongside which, built logically into the base of the camera grip, is the battery compartment, housing the EN-EL9a rechargeable lithium ion cell provided. Pretty much everything you'd expect to find on an entry level DSLR these days is present and correct on the D3000, with the nice extras of the Intelligent Guide and Picture Control settings, not to mention in-camera editing for those who want it. What I did miss however was the ability to implement Live View via the rear LCD, which on occasion lead less to instances of point and shoot, more point and guess when it proved tricky to bring my eye completely level with the optical viewfinder. Still, more positively the camera is as well made as you'd expect a product bearing the Nikon logo to be, solidly constructed and with a control layout that ensures everything is readily 'to hand' and responds instantly to user input. 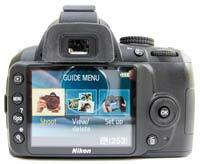 So what of the images the Nikon D3000 delivers? Do they transcend the entry-level model's mighty minnow status, or leave it wallowing in the shallows, afraid to play with the other big fish?